At some point we will all retire. Or at least reach the age when it becomes a possibility. 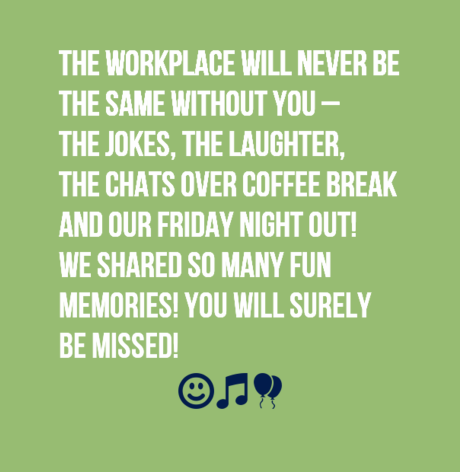 Many will choose to continue their working life as they find it brings them happiness and a sense of purpose. But just as many will decide to give up full time employment and enjoy the chance to take a break from a lifetime of work. So finding a friend is reaching that time should come as no surprise. But when it does arrive knowing what to say to them or how to wish them well can be more difficult than you might first imagine. The sort of relationship you and your friend have will play a large part in the way you wish them a happy retirement. If you’ve always had a joking or sarcastic friendship then going with something funny or that pokes fun at them is recommended. But if you’re unsure how that sort of message will be received then steer clear and avoid! The last thing you want to do is upset or offend them over their retirement. 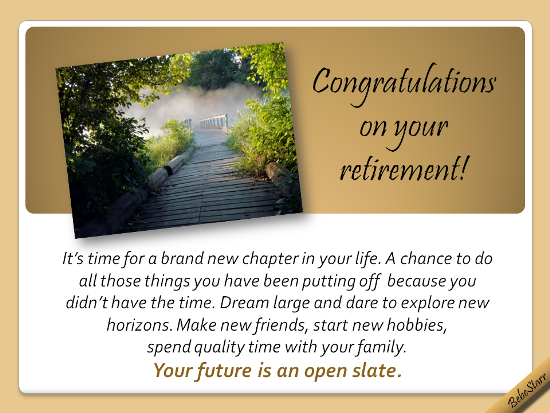 With that in mind remember that whilst some will celebrate and embrace retirement, others will fear it and find the change tough. If you feel this is the way your friend is likely to react then choose to wish them support, making sure they know you’re their for them. Maybe mention spending more time with them, and how it can be something for both of you to look forward to. Just be as positive as you can. Don’t be afraid of writhing them a retirement message though. A card, flowers or gift from you will be warmly received and appreciated. Use the retirement wishes for a friend examples below as either inspiration and ideas to write your own or feel free to copy them directly. Hopefully you will find an appropriate one that sums up exactly how you are feeling. Now that you’re retiring you’ll have more time for fishing, golfing, and sleeping in, unless of course, you want to trade places with a friend like me. To my best friend, I watched you work so hard over the years. Congrats on retiring. You have certainly earned it and more! I am so happy that you are finally retiring for now we can plan for all those trips that we never could take because you were always so busy. Welcome to real life at last. Now that you have the time available, do you think we can hang out? Today is the beginning of the rest of your life and I know that just as you worked hard in your job, you will work even harder to enjoy your retirement. According to me that is just exchanging one job for another but I wish you well anyway. Happy retirement. 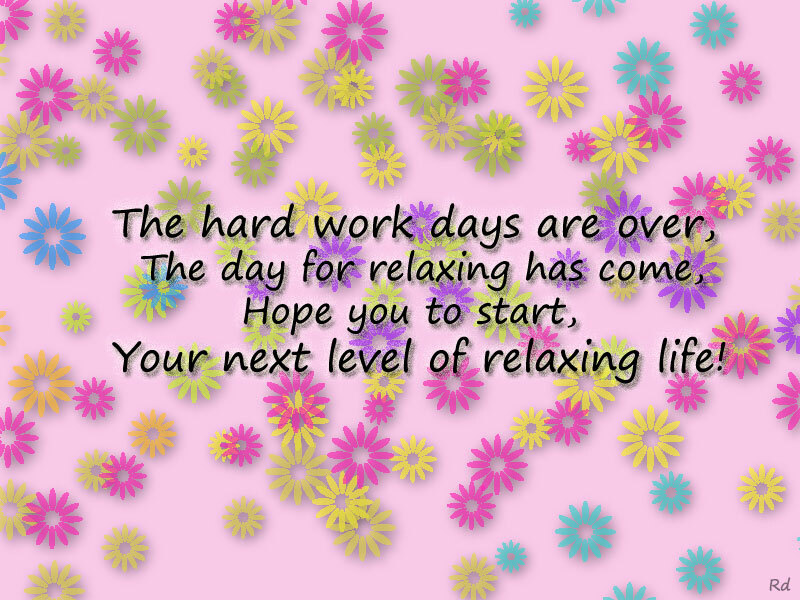 As your friend I want to say that you are a great person and an achiever, and that is what has brought you this far. Happy Retirement! Congratulations dear friend for having stood the test of time and put up with hundreds of hours of stressful work without breaking down. And now in return you are going to have hundreds of hours of free and relaxing time. May you enjoy this season of your life and just have fun. 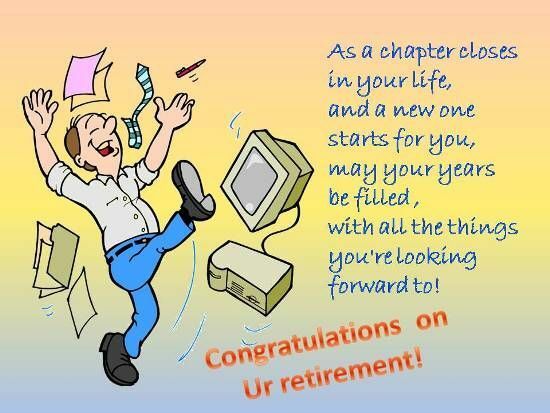 Wishing you the best the retirement years of your life! I have to be honest with you. I’m a little jealous! You finally made it to retirement! I heard of somebody who created the whole Universe and He retired after only 6 days. It took you much longer than that but you have finally made it! Wishing you only the best! Happy day!! 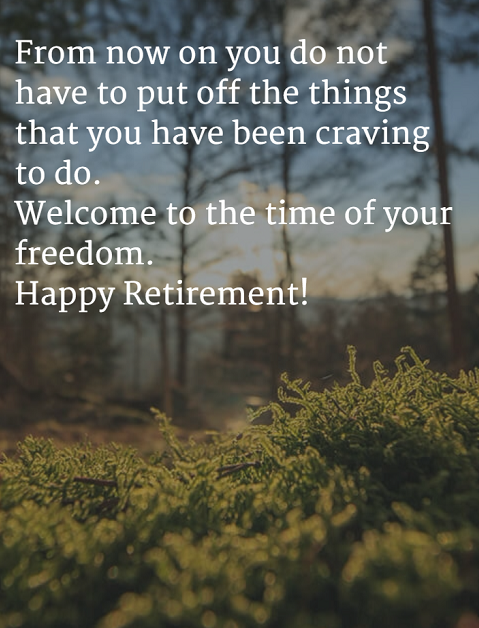 Best wishes on adventures, fun, and love during your retirement. Your limitless vacation starts now! You can indulge in the breathtaking artworks of the Louvre in Paris, take a walk at the busy streets of Tokyo, get a tan at the pristine beach of Maldives, wake up to the view of the exquisite Santorini and have a gastronomic adventure at Taipei. Congratulations! Happy Retirement! They say that life starts at 40. But the truth is, it starts on your retirement. When you have the luxury to do all the things you wanted to do. Congratulations on your exciting chapter ahead! Cheers to the great times we had together! Open that sparkling champagne and start an awesome barbeque – this milestone in your life is worth celebrating. Happy retirement!